Hardwood floors have been known to increase a homes value, but there are some caveats to consider before you go off spending thousands of dollars. Thankfully, as of this update July 2017, our real estate market has improved dramatically in most parts from the gloom and doom days. Perhaps you're not interested in increasing the value of your home, but merely trying to find avenues to get that real estate sold! Realtors agree homes with wood floors will help sell a home quicker, but the question remains; what kind of hardwood floor and do I need to spend a lot of money? What Side Of Town Is The Home Located? Let's look at our unofficial case study in several different ways. Depending on what age group or neighborhood you live in, new wood flooring may or may not work for you. If you reside in a neighborhood where income is above average, an upgrade from carpet to wood flooring is a definite plus. Potential buyers have more cash to spend and don't want to buy a fixer upper because of their busy lifestyles. Instead they prefer to buy and move into a home that looks nice. On the other hand, less affluent neighborhoods may not realize increased value with wood flooring. Condition of the neighborhood plays a role. If Randy Redneck down the street won't get his four pickup trucks (one working) out of the driveway what kind of clientele is your home limited to? Hardwood floors will stir interest and help sell the home, but I don't suggest spending a fortune. What Kind Of Hardwood To Install? Relating to the above scenarios, a million dollar home buyer is likely to be more conscious or they may have along with them someone who is more knowledgeable in better quality building materials. Choosing something more trendy is likely to be seen as a plus. Notwithstanding, lower priced homes are typically purchased by first time home buyers and a functional red oak floor may work well. 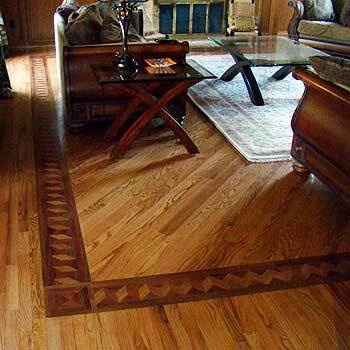 For more on what types of hardwood and where to install visit my hardwood flooring trends page. Ask yourself, what's the first thing you notice when walking into any home. Don't you look down rather than up as you enter the home? We all want to watch that first step! 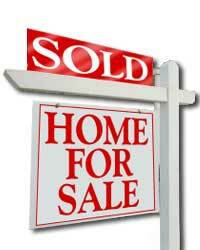 Potential buyers see floor coverings before kitchen cabinets, interior walls, or the pool off the lanai. Carpeting does not impress potential buyers. Should We Have The Floors Refinished? Let's say you already have hardwood flooring in the home. Anything that improves the appearance of the home is a plus, but a complete refinish job can be pricey. It depends on what you want out of it. A simple screen and re-coat ¹ could provide enough to satisfy a potential buyer and the cost outlay is much lower. Sometimes it takes only a few special design elements that can turn heads of a potential buyer. The border examples shown may fit the bill. 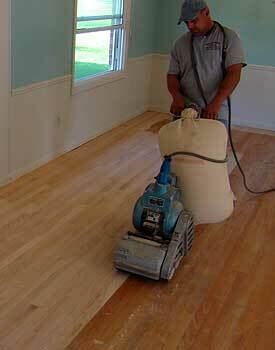 In this case, the existing floor throughout the home was being refinished. The owners added some of the wow factor by adding borders and a diagonal floor insert in two rooms along with one medallion. Borders can be installed at any time including older floors, but does take skilled professionals to pull it off. Wondering about the cost? In this example the borders averaged $20 per lineal foot and came prefabricated. During real estate slowdowns remodeling costs can be significantly lower because demand is low. Installers are not working seven days a week as they were during boom times. Now there's no rush to get the job done and move to the next one. Constant pressure from builders does not exist. Tradesman in all aspects of home improvement can actually spend more time making everyone happy. I am not implying installers don't have the time do the job right, rather they are more relaxed and willing to negotiate installation costs during slower periods. This is true in all aspects of the construction industry at the moment. Why wait until business gets hectic again? In our opinion there has not been a better time to remodel since the early eighties. Update 2014: The above was written in 2009. If you're looking for deals chances of finding them now are extremely slim. In fact some guys are too busy to even take smaller jobs. Question: We live in New York and have a real old heart pine floor that looks like it's falling to pieces. Do you think if we refinish this floor it will help sell the house, or should we have the whole floor replaced with a newer floor? See attached pictures. Reply: Old floors like that are in demand, but it will depend on who is looking at the home. Some buyers may prefer a contemporary sleek look while others may crave it as a great fashion statement. I think it also depends on what the rest of the home looks like. Does the antique look add or take away from the overall theme of things? Question: We don't have much money to install wood so we can get this money pit sold. I've heard different stories on laminate floors working as a selling point with homes. Reply: Back in the early part of this century I would have said hogwash. But there have been some impressive changes with laminate floor styles that look like hardwood. Some of the look alike distressed products almost fool me. It may be worth a try, but as far as helping sell the home I think the jury is still out. ¹ This procedure may only be a temporary solution as not all floors can be screened and re-coated successfully. 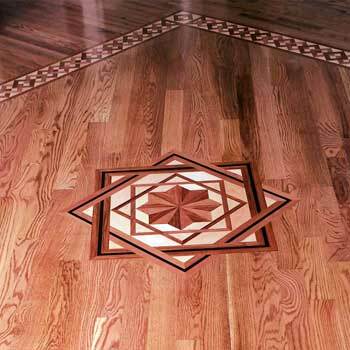 Contaminants on the existing floor may react adversely with any new finish. Blistering, peeling and bubbles are examples of symptoms.